Monday - Thursday 9:30 a.m. to 8 p.m.
Friday 9:30 a.m. to 6:00 p.m.
"We are a community bookstore that caters to our customers," says owner of the Book Stall. With over 68,000 titles in our 5,000 sq. foot store, the book selection has something for everyone: fiction, travel, cooking, children's books, biographies, and many more. Autographed books are a specialty as well. The Bookstall is classified as a general trade book store. The Book Stall is known for its many special events. You will often find literary and best-selling authors signing their books. The store also sponsors reading groups, poetry sessions and author events and writing workshops for children. Established in 1940 as Chestnut Court, we became The Book Stall at Chestnut Court in 1986. The store is connected to the popular Peet's Coffee Shop. 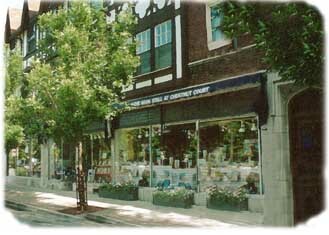 We are one of the Chicago area's most popular and busy bookstores, with events happening almost every day.